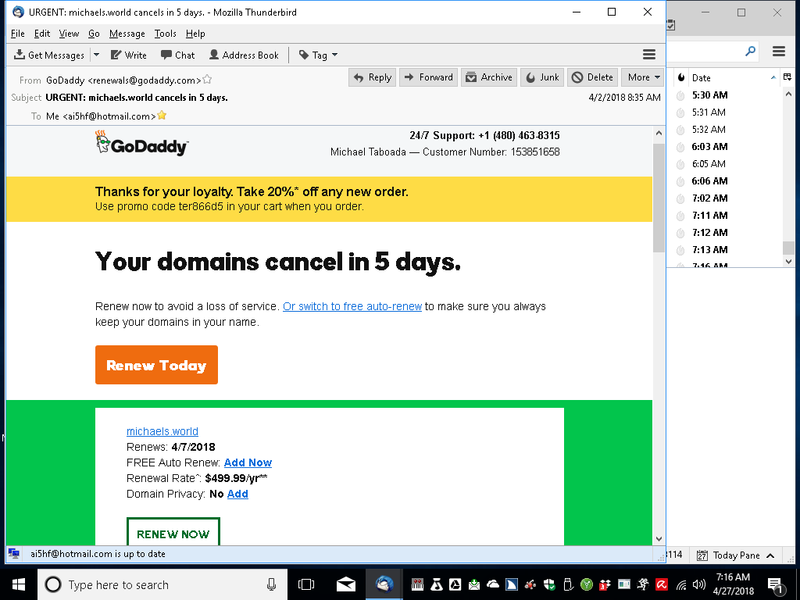 Home » Uncategorized » Beware of Godaddy Premium Renewal Fees on Non-premium Domains! Need a blazing fast and reliable server? Get one here! Hi all — long it has been since my last blog post! Well I’m here to rectify that now! So, on with the post. For those who don’t know, I own several domains. I’ve always been one to pick a suitable standalone domain for a project, rather than make a subdomain of another domain. Anyway, I was searching around for a catchy name for my blog that I was going to rename from michaeltaboada.me, and happened to find someone selling michaels.world on the godaddy marketplace. As a side note I also wholeheartedly believe in new generic toplevel domains like .world and .solutions — that’s why you’ll find probably over 50% of my websites have those kind of extentions. In fact the number that have .com and .net I mostly purchased from someone else. Lol. Anyway, I looked at the michaels.world domain on godaddy marketplace, though I didn’t have much hope of being able to afford it. Usually domains on any marketplace at all go for 1000+ dollars for the only ok domains. Imagine my surprise, then, when I was able to purchase michaels.world for $99! That’s not a typo, $99. I of course had to make sure that the domain wouldn’t renew at a ridiculous rate, thus making me need to give it up and having wasted my money. 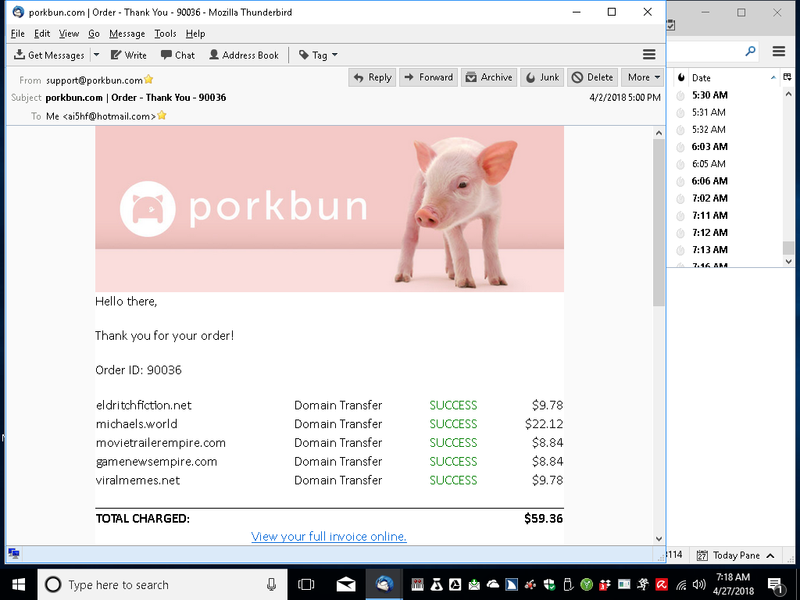 So I went to porkbun and entered it in as a transfer, but never completed checkout. They confirmed that, yes, the domain would transfer or renew at $22.12 on their platform. So I immediately purchased the domain, and waited for it to be pushed to my godaddy account. So a quick note about godaddy. This post is about something godaddy did badly, in my opinion, but I am of the opinion that godaddy doesn’t do much well. About the only thing I consider even sort of good that they do is allow beginners to get started under one roof, but with the amount they’ll pay it would be much better for them to go somewhere else, like namecheap or, more preferably, porkbun. Anyway, just wanted to get that out of the way. I’m not writing this because I don’t like godaddy, I’m writing it because even this is a new low for them, in my opinion. So I got the domain, but never really did anything with it. As a side note, I always delete my payment methods from godaddy after purchasing, and if possible purchase with paypal, because their autorenewal service is super hard (impossible?) to turn off with screen readers, and I try to never renew a domain at godaddy. Their fees are just too high. So of course I got the email “Urgent! Michaels.world cancels in 5 days!” That’s ok though, I was going to transfer to porkbun anyway. But I looked at the email anyway, since I try to read all transactional email I get sent. And there was this little section that caught my eye (well, my ear). Godaddy wants to charge me $499.99! So, for those who can’t see the picture, this email (section highlighted) says michaels.world will renew at $499.99 plus icann fee. At this point I’m a little worried. “Did the .world registry change michaels.world to a premium registration?” I was also kind of glad I hadn’t started using it yet, in case that was the case. So I went to transfer to porkbun, which I had intended to do anyway, but it wasn’t premium at all. Still the $22.12. So, again for those who can’t see the picture (section highlighted) this is a confirmation email where, among others, michaels.world was successfully paid for. It costed $22.12. A far cry from godaddy’s $499.99, and not even a premium price. So does porkbun have a bug, and it doesn’t charge premium prices for premium domains? I was assuming not, and the answer was of course no. They charge premium prices for premium domains. 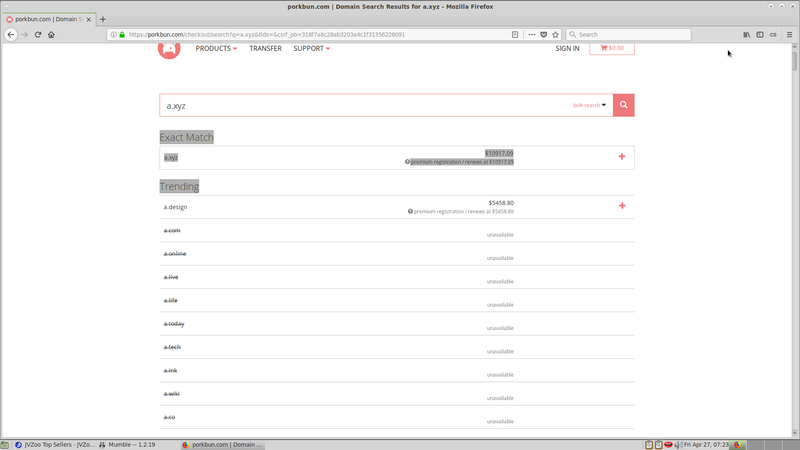 So this screenshot shows a domain search. I searched for a.xyz, and it costed an exorbitant $10,000+. So obviously their premium pricing is working. A side note: this screenshot was taken today, as opposed to the day I purchased a transfer of michaels.world, but I also checked that day and premium domains did cost the full price. So for some reason godaddy took it upon themselves to renew my non-premium domain at a (very) premium price. Not sure why they did this, but it just strengthens my conviction that godaddy is not to be bothered with practically at all. About the only thing I use godaddy for is $0.99 domains for projects that I don’t know if they’ll go anywhere. Of course if they do go somewhere, I transfer to porkbun or another domain registrar after the one year. In closing: Don’t use Godaddy, use Porkbun or even Namecheap. your wallet, and probably your sanity, will thank you.